San Francisco has many cultures, influences and characters that contribute to the city’s unique flavor – a fact that was quickly reinforced when I entered Bissap Baobab, a wonderful little Senegalese bar and restaurant on Mission Street. West Africa's Ivory Coast is brought to San Francisco with dining, drinking and dancing. 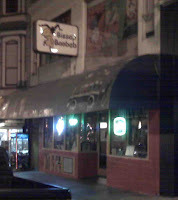 The dining and drinking happens at the Mission Street location while Bissap Baobab’s sister location, Little Baobab found around the corner on 19th, turns into a dance club around 10pm. DJs spinning to an energetic and vibrant crowd help liven up the Mission Neighborhood on weekends. The restaurant’s host - who jumped from his seat to greet patrons the minute they walked in - sat next to me at the bar as I looked over the menu considering one of the many specialty drinks before deciding on a tried and true Fat Tire draught. Fat Tire in hand, I continued to peruse the menu which contained ethnic Sengalese cuisine along with a number of homemade rum concoctions that I'm sure would get the most tolerant of drinkers buzzed after a few sips. No eats for me but judging by the steady stream of diners who came in that night, Bissap Baobab is a popular dinner spot. A few large parties waited in and around the foyer’s padded wall seating while a few scattered couples and groups bellied up to the bar in hopes of ordering a drink before being seated. As a basketball game played on the TV in the background, I noticed the Bissap Baobab’s community consisted of two very distinct groups, a healthy assemblage of Senegalese transplants and Mission Street diners. The Senegalese wait staff (not kitchen staff who looked to be largely Latino), regularly conversed with their fellow countrymen, who dropped in for some drinks and dinner, exchanging pleasantries and hellos in their native French. The diners consisted of birthday groups, Missionites and a few couples enjoying a Friday night out. Bissap Baobab … Bissap, the Senegalese name for the Rosell, a species of hibiscus flower and Baobab, is a tree native to mainland Africa, Australia and Madagascar some of which are reputed to be many thousands of years old though this is difficult to verify because the wood does not produce annual growth rings, is a perfect Friday night Ivory Coast-stay-cation experience, and a vivid reminder of the Mission District’s unique cultures and diversity. 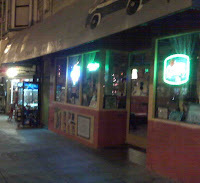 Attire is casual, food decent, drinks strong – all good qualities in a Mission on Mission stop.